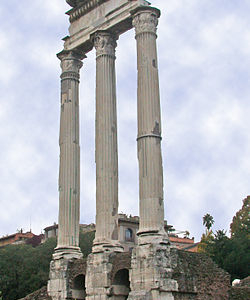 The Temple of Castor and Pollux (Italian: Tempio dei Dioscuri) is an ancient edifice in the Roman Forum, Rome, central Italy. It was originally built in gratitude for victory at the Battle of Lake Regillus (495 BC). Castor and Pollux (Greek Polydeuces) were the Dioscuri, the "twins" of Gemini, the twin sons of Zeus (Jupiter) and Leda. Their cult came to Rome from Greece via Magna Graecia and the Greek culture of Southern Italy. The last king of Rome, Lucius Tarquinius Superbus, and his allies, the Latins, waged war on the infant Roman Republic. Before the battle, the Roman dictator Aulus Postumius Albus vowed to build a temple to the Dioscuri if Rome were victorious. According to legend Castor and Pollux appeared on the battlefield as two able horsemen in aid of the Romans. And, after the battle had been won they again appeared on the Forum in Rome watering their horses at the Spring of Juturna thereby announcing the victory. The temple stands on the supposed spot of their appearance. Postumius’s son finished the temple in 495 B.C. The octostyle temple was peripteral, with eight Corinthian columns at the short sides and eleven on the long sides. There was a single cella paved with mosaics. The podium measures 32×49.5m and 7m in height. The building was constructed in opus caementicium and originally covered with slabs of tuff which were later removed. According to ancient sources the temple had a single central stairway to access the podium, but excavations have identified two side stairs. Here's the our members favorite photos of "Ruins in Rome". 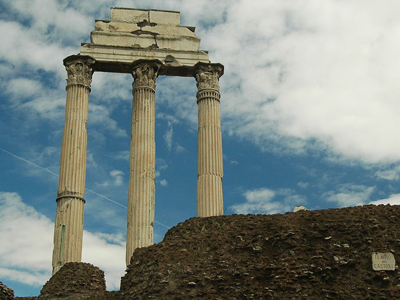 Upload your photo of Temple of Castor and Pollux!